Having discovered a number of churches lacking a church micro in the area, we are seeking to correct this... Starting with the Catholic churches, as they are best known to the family, this is our first cache. The Church of the Assumption of Our Lady has a lovely garden but the priest did not want to think about a cache on the land so this is a multi, though fairly simple and close by. In 1903, there were just a handful of Roman Catholics in Englefield Green. One of them, a Major General Arthur Kennedy Rideout living at Sandylands, arranged for a priest to ride out from the Twickenham area to celebrate Mass. He built a small chapel in the grounds of his house using corrugated iron, large enough for about 25 people. Subsequently, in 1907, a wooden church was built in Harvest Road. The original church from Sandylands was added on to it, forming a vestry. At that time the church was dedicated to St Cuthbert. Around 1930, parishioners Gerard and Miriam Jurgens bought a piece of land in Harvest Road and built the present church at their own expense to replace the existing wooden one. The church is in Italian Romanesque style and was blessed and opened on September 20th 1931. At the request of the Jurgens family the dedication to St.Cuthbert was altered and the new church consecrated in honour of the Assumption of Our Lady. A painting of this subject by Antonio Palomino (artist to the kings of Spain in the seventeenth century) was given to the church and hangs above the high altar. David Greig, the founder of a then well known chain of grocery stores, donated the organ. The old wooden St.Cuthbert’s church served the parish as a church hall after the new church was built. This hall later became a school when a number of children were evacuated to Englefield Green from the East End of London during World War II. The name Saint Cuthbert has been perpetuated in the naming of this Roman Catholic Primary School, now in Corby Drive. 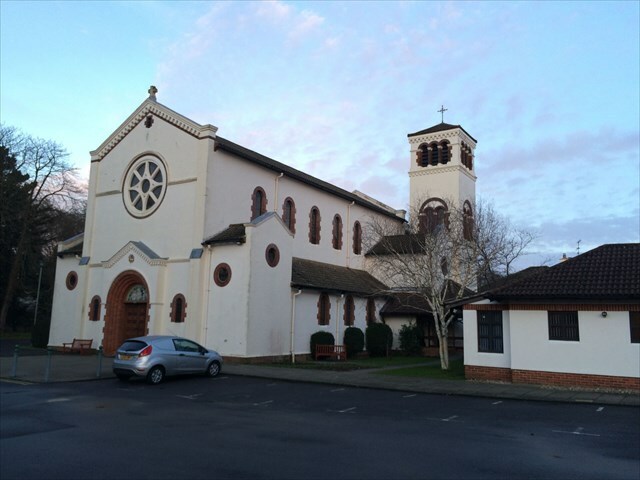 It also serves as the Parish name, covering the church of the Assumption and St John of Rochester, Egham Hythe. Congratulations to Bike pirate for the FTF!